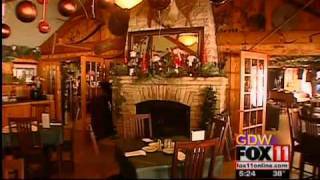 Does a log cabin in the Northwoods on the popular Eagle Waters Resort sound nice? You betcha it does. This resort has so much to offer, it would be impossible to go through everything on this one page. This resort is terrific for families and couples alike as well as for weddings and retreats. The dining experience is highly rated (just read the reviews) and the setting on the lake makes this highly enjoyable. Enjoy magnificent sunrises and sunsets, large conference center and heated outdoor pool. Hear the loons play in the water or the deer frolick in the woods. This family friendly resort will keep the whole family happy-no matter what they love to do! This resort is located on the largest freshwater chain of lakes in the world. Explore many area things to do such snowmobiling, hiking, golfing, hunting, fishing, ice fishing, cross country skiing, or simply doing nothing. Eagle River boasts that this area is for letting go and leaving the clutter behind. Whether you choose to leave the resort or not, you can certainly do that by using our site sauna, massage room, whirlpool, and restaurant with your very own cabin. Want to know something cool? The very first votes for Lincoln to become President were done on this historical resort! Oure resort has been around that long, and for good reason. You are never just a newcomer but a guest for life. Settle in to your favorite Northwoods experience in Eagle RIver. Just at the resort alone, there are many things to do, rain or shine. Outdoors, there is a basketball court, sand volleyball court, horseshoe pit, playgroud, swings, picnic area, lakeside swimming area, tennis courts, outdoor heated pool, and fish cleaning house for all of your fishing needs. Indoors, there is a restaurant for those days you don't feel like cooking. One of those days could be after your massage or time spend in the sauna or a crazy afternoon beating the kids at the indoor arcade room, darts or pool. (who thinks the loser should have to make breakfast in the morning, we sure do!). This year round resort also has the world's largest cranberry fest, the Eagle River snowmobile 500, The Amsoil World Championship Derby (can you tell snowmobiling is the ultimate winter activity here? ), Lake of the Torches Casino, Even jump ship at Pirate's Hideaway, a fun family adventure or a fun wedding party activity. There is always something to do in Eagle River. Jean ann Jordan: We love Eagle Waters Resort. The food is excellent, staff members are friendly, service is wonderful. They have a great area outside to sit and enjoy music. The inside is very interesting with all the old decor. A must for anyone, and our favorite place dinning.